If Booster Gold stole seven super powers and then stole ten more, how many super powers has he taken in all? HeroesCon 2017 was two weeks ago in Charlotte, North Carolina. Booster Gold has traditionally been well represented by cosplayers there, and this year was no exception. Shag of the Fire and Water Podcast Network spotted these two at Heroes Con this year and posted this pic to Twitter. Jay Tallsquall also played Booster at last year's con, but his Justice League International teammate Gypsy is a welcome addition to the party. 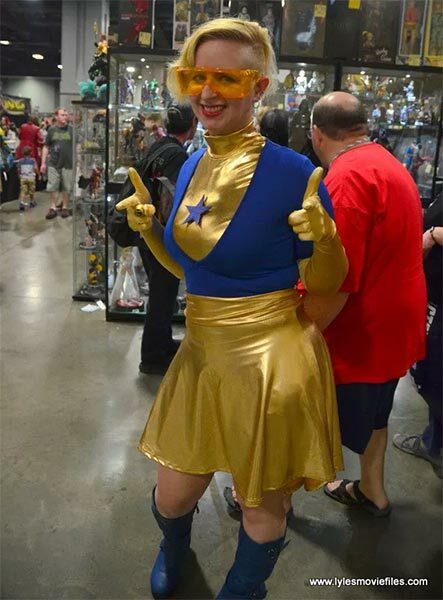 Elsewhere, Jeffrey Lyles of LylesMovieFiles.com, uploaded his photos from April's Awesome Con in Washington, D.C. where he spotted this female Booster Gold cosplayer. It's so heartwarming to see Booster still getting the love at conventions despite the character's continued absence from the limelight. You cosplayers are definitely Boosterrific. If Booster Gold stole three super powers and then stole four more, how many super powers has he taken in all? If Booster Gold travleled forward in time seven years and then traveled back five years, how many years forward is he now? If you think about it, we owe the longevity of our hero to the success of 1987's Justice League reboot which launched 30 years ago yesterday. Although Dan Jurgens created a unique and endearing character in Michael "Booster" Carter, it was the character's inclusion in J.M. DeMatteis and Keith Giffen's reboot of DC's flagship team (and specifically his relationship with Blue Beetle) that cemented Booster Gold's place in the DCU. Without the JLI, Booster Gold probably would have faded to the same sort of neverland as other lesser known DC characters like Geo-Force or Blue Devil. In celebration of the anniversary, the Irredeemable Shag interviewed DeMatteis for a very special edition of the Justice League International: Bwah-Ha-Ha Podcast. 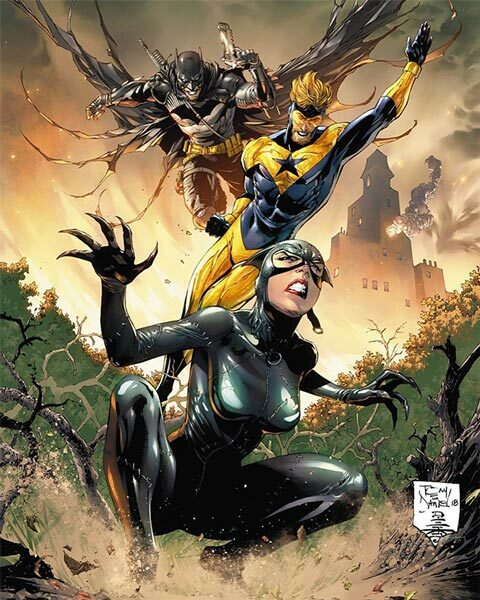 The writer admitted that Booster Gold held a unique place in the series. Shag: Favorite JLI members. Give me like two or three. DeMatteis: Well, Beetle and Booster for sure. Because in so many ways, they're the heart and soul of the book. ... I love the banter, and I love that we continued to play with them. You can find the whole podcast interview, which covers the JLI from their inception, through their name changes, and into the year 3000, at fireandwaterpodcast.com. Something tells me we'll still be celebrating the JLI when it's 60th anniversary rolls around. In every medium, great entertainment endures. I always feel like it's a darn shame they didn't do more with JLI in terms of translating it to other media. There was the failed Pilot back in the 90's, I think, but it would have made a great animated series, or even that it should have been what Legends of Tomorrow is in Berlantiverse. Oh well. We'll keep dreaming. If Booster Gold gave two news interviews and then gave ten more, how many interviews has he given in all? Pal Shag! 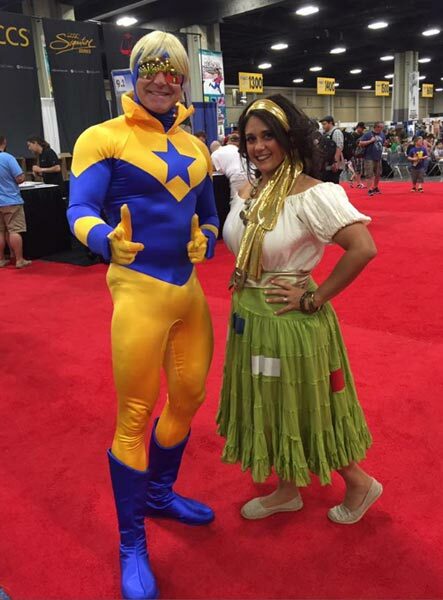 of FirestormFan.com called our attention to this Booster Gold cosplayer on Twitter earlier this week. This is a cosplayer we've seen before. He's attended conventions dressed as Booster Gold for the past three years! He wore this costume to last year's HeroesCon and he wore the collared variant to DragonCon 2013. I love the persistence. For the record, this pic was posted by @TrekkerTalk. Big thanks to both Trekker Talk and Shag! And unknown cosplayer, whoever you are, keep up the good work! UPDATE 2015-06-23: The cosplayer has been identified Jay Tallsquall. Thanks to Pyynk for the identification. If Booster Gold had seven dollars and earned ten more, how many dollars does he have in all? If Booster Gold travleled forward in time eight years and then traveled back two years, how many years forward is he now? Earlier this week, I paid a visit to The Irredeemable Shag's FirestormFan.com, which just happened to be running a post on the "Great Heroes" DC trading cards from 1987. 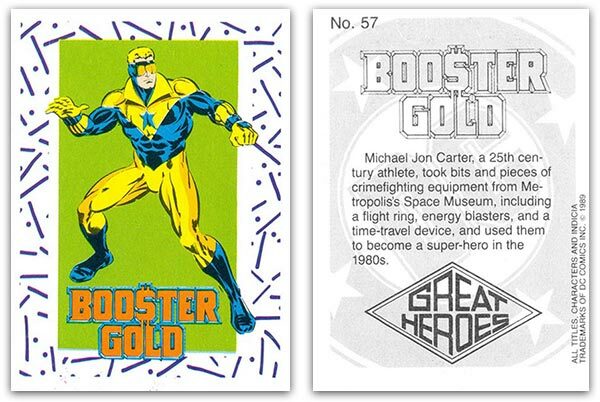 They were trading cards printed on backing boards included with 3-pack comic books in the late 1980s. I'd never heard of these before. Could there be a Booster Gold? The card was just one of 8 on its original board. You can see a picture of the whole board at Kooiman's slideshow of the entire set at ComicTeams.com. This card has been added to the Boosterrific.com archive of Other Media appearances. 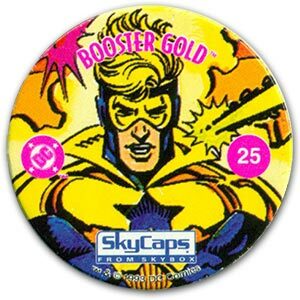 But while Michael was giving me the pic for the card above, he graciously forwarded a great scan of the one and only Booster Gold pog from SkyBox in 1993! My thanks to Michael (and Shag!) for helping make Boosterrific.com more complete than ever. If you had seven Booster Gold autographs and Booster gave you ten more, how many autographs do you have?